The average millionaire has 7 sources of income. The great news is that with the internet, easy selling tools like Shopify and other platforms (ahem WordPress), you can be closer than ever to start diversifying your income and stop relying on just your salary. If you are a newbie to digital marketing, fear nothing. I used to be in your shoes just a few years ago. But with massive action and by following the right advice, I was able to start generating some serious passive income. Nowadays, I monetize my blogs through adsense, receive income from Flux Chargers, and sell affiliate products via Amazon. If you ever wondered “how to make money online”, then today I’ll present you 8 ways to starting earning your first few dollars online. Just a heads up: If you don’t act on the knowledge I’ll present to you, you’ll never get the results. So, accept the fact that it will be tough, and just stick with it long enough. It is different from traditional marketing which is the process of promoting products through the use of tangible items such as posters, business cards or print ads on newspapers and magazines. Digital marketing, on the other hand, is conducted exclusively through digital marketing channels which gives marketers more control, refined data, and tools to analyze the effectiveness of a particular campaign. There’s no doubt that the most common channel associated with digital marketing is the web. However, other than the internet, there are various means of digital marketing, which includes mobile instant messaging, podcasts, electronic billboards, radio channels, and digital television. Digital marketing allows businesses to reach their target audience cost-effectively and measurably. Moreover, it helps in driving more online sales and increasing brand loyalty. Facebook for instance, has very granular targeting options that allow you to reach say “Moms 30-40 years old in Arkansas who love rock”. Search Engine Optimization is the method of increasing a website’s ranking on search engines like Google, Bing or Yahoo and driving traffic via specific phrases or keywords related to your site. SEO’s goal is to send more free traffic to your website coming from your target audience. It is one of the most effective digital strategy being used today since it attracts potential customers on your website for free, which can then later be turned into leads and customers. SEO is an essential requirement when it comes to digital marketing. Every internet user begins their research for information on a search engine. Among internet users, more than 30% click on the first item on the search results and less than 10% make it to the second page. Here’s my advanced guide to SEO which explains how I’m currently driving 150,000 visitors each month to my blog. Perhaps you’re wondering what’s the difference of search engine marketing with SEO. The two can be a confusing concept to grasp, but it is essential to know the difference between the two terms. Both SEO and SEM aim to increase the visibility of your website in search engines, but SEM makes use of paid traffic. In SEM, you pay for the advertising space in the search engine results. So instead of trying to get a higher ranking and get free traffic on your website, you pay in order to be visible on the first page of search results. Google Adwords is the most common medium for SEM, wherein you can have your ads appear in the Google search results and pay only for the clicks on your ads, this method is also known as “Pay-per-click” or PPC. Yahoo and Bing utilize the same system, but Google Adwords is the most successful in garnering traffic. It’s crucial that the content you choose is beneficial and relevant to your target audience. For example, if you run a business about clothes, you could write an article about the latest fashion trends. With this strategy, you make use of content with specific words relevant to your target audience who are also your potential customers. Moreover, content marketing is an effective strategy that delivers impressive return on investment (ROI). Compared to traditional marketing, content marketing generates more leads and clients for your business. When it comes to advertisement, more than 60% of consumers prefer companies that create content in promoting their products. When you create a very popular blog, you can monetize it by selling products, advertisements or selling the entire website itself. When it comes to marketing via social media, the primary goals are to promote brand awareness and increase conversions of viewers to customers. This strategy focuses on creating promotional and informational content while interacting with your potential clients. Social media is not only a means to share pictures and life updates with friends and family, but it is also utilized by companies to connect to their customers. Social media now serves as an outlet to gain positive reviews from past customers and encourage new ones to have a try of offered products and services. In a world where social media is so mainstream, businesses will likely benefit on this digital marketing strategy. Studies show that more than 25% of a typical internet user’s time is spent on social media platforms, and more than 70% of shoppers get influenced by social media when making purchase decisions. Want to go viral on Facebook? Here’s how. Nowadays, mobile devices are integral gadgets to us. We always keep our phone in our pockets and continuously checked it throughout the day. Hence, it can be a very useful channel for digital marketing. In mobile marketing, you try to reach out to your customers through SMS and MMS, push notifications, app-based marketing, in-game mobile marketing, or QR codes. The latest trend in digital marketing today is developing mobile apps for work, lifestyle, or leisure such as online games. These apps have millions of users daily. Developers can make them available on app stores, such as the Apple app store, Google play or Amazon marketplace. Mobile marketing lets you promote these apps through either paid advertising or cross-app promotions so they can be visible and installed by more users. Here’s a little story of how we got our game Poos Caboose featured in 155 countries on the App Store. Affiliate marketing refers to the process of promoting other people’s products or services, and in return, you receive a commission for every sale or client you introduce. Big companies like Amazon have affiliate programs, that pay out millions of dollars monthly to websites that sell their products. If you are aiming to promote your products or services online, you should consider setting up an affiliate program where interested individuals can do the work for you in promoting it over the internet. If you are looking for high paying adsense keywords, here they are. Influencer marketing is a combination of both old and new marketing tools. It involves the idea of identifying, engaging and supporting individuals with high-impact conversations with consumers and making use of it to create a modern-day content-driven marketing campaign. An influencer, either a celebrity or a well-known individual in the society, can talk about your products or services to their followers on social media. The easiest way to work with influencers is to pay them money for the endorsement. However, it has its own downside too since most consumers know the influencer is getting paid to promote a product, so its effectiveness can’t be guaranteed. The goal of this digital marketing strategy is advocacy. Influencer marketing should be authentic and honest so that people will get more interested. You can take advantage of influencer marketing even without financial compensation. An influencer can talk about your product not because they’re being paid, but because they’re simply satisfied with your product and service, and want to share the useful information to their loyal readers or viewers. Want to learn how I grew my Snapchat account? Email marketing is a cost-effective digital marketing strategy that focuses on keeping existing customers, as well as gaining new ones. It’s an excellent strategy to encourage repeat purchases, increase brand awareness, and make your business the first choice among consumers. Even if they may not need your products and services now, email marketing will help in reminding your customers to remember your brand when it’s to make a purchase. The primary goal of this strategy is to provide existing clients with valuable information, such as relevant industry news, and personalized content like product coupons, to encourage them to come back. Related: Here are some tools you might find useful if you are just starting out. How to Make Money with Digital Marketing? 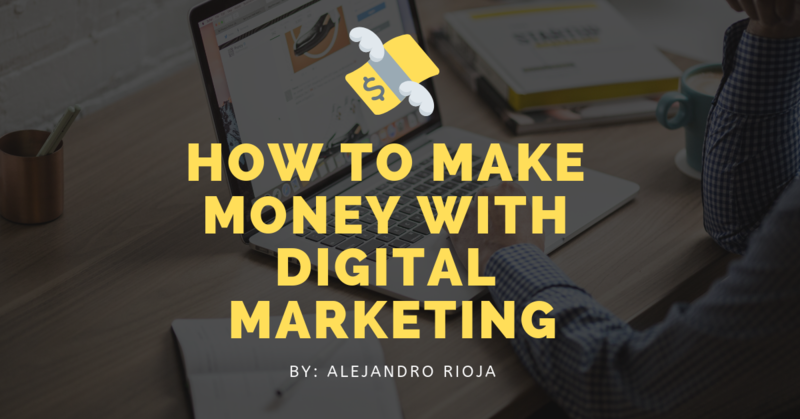 Now that you know all the common digital marketing strategies employed by businesses, it’s time to learn the things you can do to earn money via digital marketing. Extending beyond the purpose of self-expression and sharing your expertise and experience to everyone, blogging can also be a source of income for you. Some people started creating their blogs with this objective in mind (This is why I started The Insurance Nerd for instance). While some convert their long-standing blog to one that will bring profit to them. Blog advertisements are banners or links that you can place on your blog, which when clicked direct your reader to another website or to the advertiser’s products. Each time a reader clicks on the advertiser’s ad, the blogger gets paid for every click, impression or action done. If you want to monetize your blog effectively, you can try finding affiliates in your niche that offers excellent products for your target audience. This is where affiliate marketing comes into the picture. You can adapt the said digital marketing strategy on your blog and effectively monetize even if you have a small audience. Aside from selling ads on your blog, another simple way to earn extra income from blogging is to write sponsored reviews. You can make more money in writing reviews for businesses, products, and services, websites, etc. For instance, people review our portable charger and earn a commission on each sale made. A sponsored review is also a form of advertising, but promoting the product indirectly. In order to get paid for a review post, you can reach out to a potential client who might be interested in buying a review blog post. Sometimes, it’s the company who contacts the blogger directly, asking to review a product in a sponsored post. You can also try signing up for a network that connects advertisers and bloggers or publishers, like Tomoson, Fango, and Izea. Probably, the most popular among millennials nowadays is video blogging or vlog. Aside from providing entertainment, one can actually make real money as a vlogger. All you need is a webcam or a video camera, some video editing skills, and the passion for succeeding. You can publish your videos on your website or upload them on social media platforms, such as YouTube. You can get a commission for every advertisement views on your YouTube account. For beginners, a good way to start monetizing a vlog is through Google Adsense. Google will place ads from time to time when people are watching your video. The more popular your vlog becomes, the higher the chance of making more money. Here’s my comprehensive guide to Youtube SEO. If you would instead not advertise other people’s products or write sponsored reviews for them, selling products is an efficient way to earn money from blogging. This can be a useful source of extra income once you’ve managed to gain a loyal following of readers. You can sell anything on your blog, but it is recommended to choose products and services related to your field of expertise. You’ll have to focus on areas where you have experience and have enough knowledge about. E-books, online courses, consultation, memberships, subscriptions, and physical products are just some of the things you can sell on your blog. Of course, I sell the Flux Portable Charger. Here’s how we grew that business. In connection with selling physical products on your blog, you might want to level up and start creating your own e-commerce business. Nowadays, people are more inclined to purchase products straight from their smartphones and tablets. By making use of the previously mentioned digital marketing strategies, you can build a successful e-commerce business that can provide a better source of income. As a beginner, you can try starting with dropshipping. Drop shipping is a business model which enables a store to operate even without maintaining an inventory. Whenever a store sells a product, the merchant buys the item from a third party who will deliver it directly to the customer. The merchant doesn’t need to have an inventory or products in stock to sell products online. Drop shipping is a very convenient way to earn money since it’s easy to get started and doesn’t require much capital. You can launch your own e-commerce store without having to invest a significant amount of money on inventory. Here’s how I started my ecommerce business and grew it to $100,000/mo in revenue. If you got the skills in digital marketing, why not try becoming a freelancer. Digital marketers are everywhere on the internet – designing website layouts, sharing informative content on social media, engaging in online communities, joining a conversation on LinkedIn, and trying to make use of one or more digital marketing strategies to make sure their clients’ businesses improve on sales and leads. Aside from earning extra cash, freelance digital marketing can be an excellent investment for you to learn and develop new skills, expand your network and grow professionally. Btw, you can find a lot of great freelancers on Fiverr. If you have a large following on your social media account, you can monetize your influence and generate revenue streams by making use of influencer marketing strategy. However, as previously mentioned, this paid promotion has no guarantee to improve a business’ sales since consumers are aware of the sponsored advertisement. For the past decade, digital marketing has become the most popular buzzword among old and new entrepreneurs and professionals. It’s no surprise why there’s a growing number of people using it as a handy tool to earn either extra or steady income. But let me be clear, there’s no shortcut to earning money. Similar to every other job, you must put effort and spend the time to learn the basics in digital marketing before diving into it. The more knowledgeable you are, the more you can strategize well your digital marketing techniques and make considerable earnings eventually. If you are ready to move to more advanced topics, read my best digital marketing posts. Bookmark Futuresharks.com for more articles like this!